The Creative Eye: All working artists struggle to be more creative. This life drawing course will clearly explain what you’re up against. Through a series of practical exercises that reveal what is going on during the act of drawing it brings to life the unique teachings of Heather Spears from her book The Creative Eye. 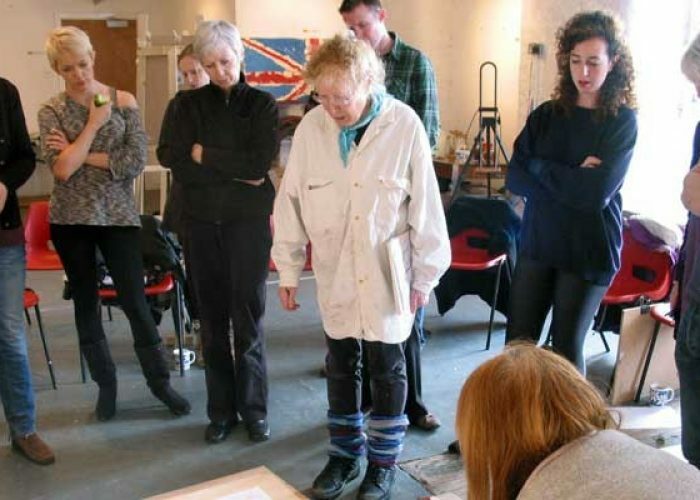 The course offers 4 days of drawing from a life model and offers practical solutions that will help every artist draw better as well as overcome creative blocks, bad drawing habits and common preconceptions. The teaching style continues in the tradition of contemporary observational life drawing. A great opportunity for beginners and experienced artists to immerse themselves in life drawing and creativity. Your tutor, Brian Raymond, will enable you to experience the life drawing insights of Denmark based Canadian artist, poet and novelist Heather Spears from her outstanding book The Creative Eye. The Creative Eye is a welcome addition in the tradition of Kimon Nicolaides’ original 1941 masterpiece The natural way to draw, and brings the understanding of life drawing into the 21st century. I was fortunate enough to benefit from Heather’s teaching when I met her in 2011. I have since invited her to teach at my studio on numerous occasions over the previous few years. This is a fully taught and directed drawing course where you will be drawing directly from a variety of life models. Your tutor will be Brian Raymond who brings his own experience and knowledge to help bring to life the unique insights from the pages of Heather’s book The Creative Eye. Your drawings will benefit from a deeper exploration of the processes of life drawing and gain a deeper understanding of creativity and visual perception. You will come away with a heightened passion and insight for life drawing with a toolkit of new techniques to help you draw more accurately and avoid many common drawing errors. This intensive life drawing course stretches over 20 hours of learning time and is fully taught and guided, with a series of exercises and creative processes to enable you to understand and fully experience all the techniques and insights that Heather has written about in her book The Creative Eye. You will gain a deeper understanding of the creative process, insights into why artists struggle with drawing from the model and learn a wide variety of techniques and skills to enable you to draw more accurately and avoid many common drawing errors. Through her writing, Heather encourages her students to stretch and develop their artistic abilities and your tutor Brian will do the same in order for you to understand every aspect of her book. Being willing to take risks, rather than being good at drawing, is the important thing. Learning that you can make new choices about paying attention. Choose this course if you want to revive your passion for life drawing and learn about Heather Spears’ approach that will change your attitude to life drawing for ever. I would like to book a place on the next Creative Eye course. Can you send me details please? The artist and author Heather Spears comes over from Denmark to teach this course. At the moment we have not set dates for the next course, but I hope it will be in the autumn. Dates will be posted as soon as we have settled on a date. If you would like to attend peer-led life drawing sessions I run these in my studio on the 1st and 3rd Tuesday each month – you’ll see details on my website about these sessions. I hope this helps. Best regards, Brian. Looking forward to returning to Manchester in the spring. I am immersed in writing about drawing and it will be great to be acually drawing with students, getting into the process again. The location is special and inspiring, and the courses so well organized, Brian, it will be a wonderful experience as always. Hope there will be a course of drawing the human head too. Good to hear from you. So pleased you’re looking forward to teaching in Manchester. It will be a pleasure to have you stay once again. I’ll be drawing with your students as well – I find there’s always something new to pick up and learn from your teaching – even after doing the course a few times. Thank you once again. So glad you like the site. I’m looking forward to hosting you next year when you come over to teach this course. Perhaps ‘Drawing the Head’ as well.